In Git Minutes #32, Adam Spiers talked about git-deps, which was interesting for me. We don't cherry pick usually nor backport commits, but I analyse bugs trying to find out when and with which the buggy code was introduced. So I gave it a try. 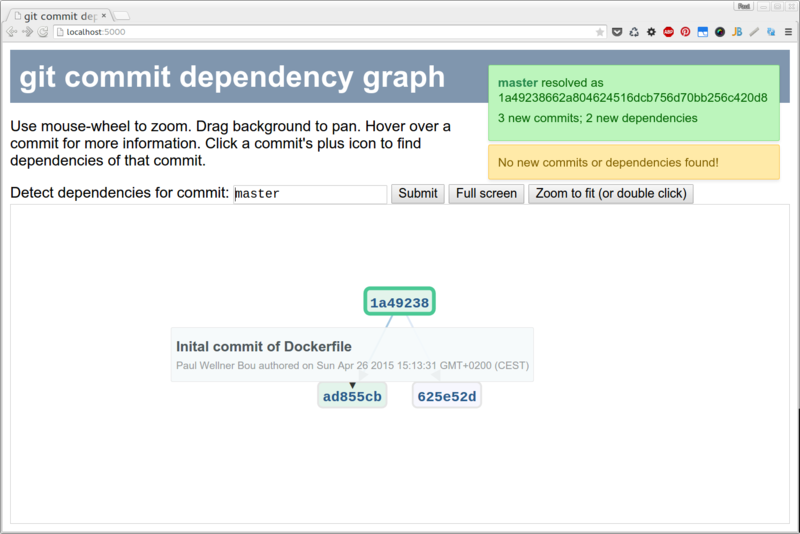 Just before Ubuntu released 15.04 it was not trivial to install the required dependecies for git-deps, namely libgit2 >=0.22, I created a Dockerfile based on Ubuntu 15.04, which brings all dependencies for git-deps out of the box. The git-deps visualization server starts by default when starting the docker container, but you can log in with your bash as well, for command line git-deps operations. All this is documented in the README. To get this working in a separate container, this bugfix made it into git-deps.